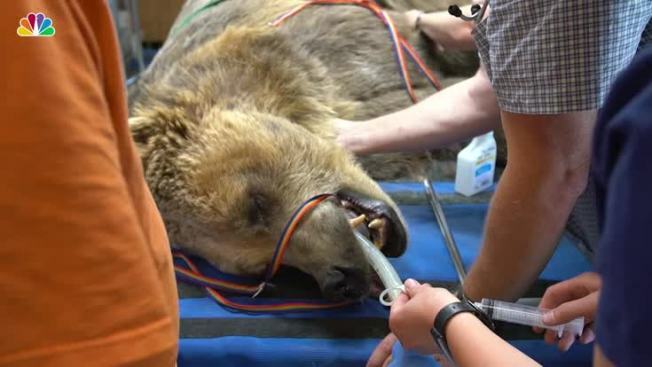 A team of veterinarians and specialists performed a root canal on a 538-pound grizzly bear named Albert at an animal rescue in Alpine, Calif. If you thought your trips to the dentist were unbearable, just be glad you aren't this 538-pound grizzly. An eight-person team of veterinarians knocked out Albert the Grizzly last week to give him a root canal and extract one of his teeth. The veterinarians also ventured into the mouth of his buddy, Hank the Tiger, who had five root canals, which took more than three hours to complete. Both the creatures are from Lions, Tigers & Bears, a wildlife Sanctuary in Alpine, California. A bear decided to take a dip in a La Verne, California, pool on Sunday, July 9, 2017. The bear swam in Denise Reeves' backyard for about 25 minutes before police helped shoo him away after he started to play with the pool equipment. The bear climbed a line of 10-foot bamboo trees and went back into the wilderness. Both Hank and Albert are in "excellent" health following their surgeries, the sanctuary wrote in the post. Lions, Tigers & Bears wildlife sanctuary is accepting donations to offset the cost of the dental procedures.